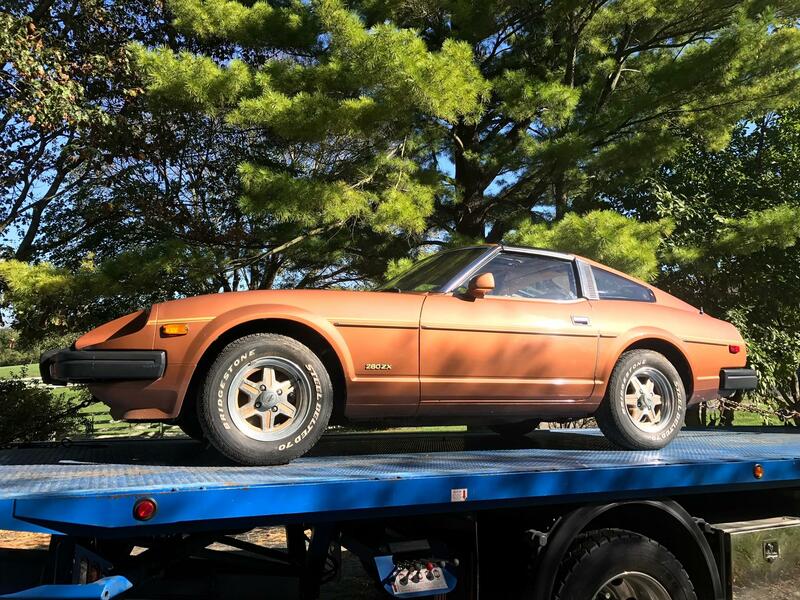 1981 280 ZX purchased brand new on January 12, 1981. Currently has 25,500 miles on it. Engine is an L28E. Serial 535372 with a P79 Head. Manufacture date September, 1980. Color code 093 Lt. Brown. Not sure but I have the same chrome trim on my 1981 280ZX. I would think the chrome trim would fit but not sure. Original Engine Bay Paint Marks "KLK"
Can someone help me identify these marks? The marks, hand made in blue-green paint, says "KLK." It has been there since the day I purchased the (S130) 280ZX, brand new in January 1981. Manufacture date is September 1980. I have no clue what it means or who put it there. But, I believe it was painted in the factory. I say that because there is one other short paint "line" of the same color and brush width on the end of the valve cover at the firewall (see photo). And, another painted circle of the same color and brush width on the top front of the valve cover (see photo). And another attached photo shows just the KLK paint marks (delineated by the white arrows). Does anyone have any thoughts on the history of placing paint marks like this? Is there a value to keeping the paint mark? Does any original owner have a paint mark like this under the hood? I'm very curious. Please help! Thank you! Many thanks for the heads-up on this. I gave up and had the original thick sound deadener at the firewall cleaned and deodorized at a fire restoration company. Then I re-installed it. I just saw the other day that Eastwood is selling it in sheets. Just in the past 5 days or so. Unfortunately it's too late for my car. Lots and lots of shelves and table space. Take lots of photos. See the shelving and tables for my parts. Includes photos mounted on foam core to help putting things back together. I just found the receipt. SEM No. 62223 EZ Coat Olive Green. I will have to check the can. It's at the shop. I will photo the can for you. I can't get in there until Monday. There is no plastic coating on my brake lines. With today's gasoline, should I revise the timing curve for my S130 1981 280ZX? If so, can someone provide appropriate information? My plan is to use 91 Octane fuel without additives. I can get it here locally. Engine is designed for "Unleaded Fuel Only" as labeled outside of the fuel filler. Use of Mobile 1 Synthetic oil on Fresh Engine Build? I had my L28 engine on my 81 280ZX freshly rebuilt. I am reaching out to the community to see if it is good to use 0W40 or 10W40 full synthetic oil on a fresh rebuild? I found a can of spray paint that exactly matches the exact color of the existing lines. I obtained it from a local specialty paint store. Made by SEM. Greatly appreciate the comments. I have located a LOCAL source that will match paint color and put it in a spray can for me. So I'm working on that now, before the engine is re-installed. Lot of parts yet to be re-installed on the engine. OMG! We can't loose your Z !! Just glad you saved it! Hope you have good antique car insurance. I'm also looking for a dash cam. Hopefully others can contribute for the benefit of many others. Time to put it into the garage for the winter? Wow. Your parts look like they have been coated with the yellow cadmium, having a slight iridescent tint to them! That makes sense since a lot of my parts have the yellow cadmium / yellow chromate coating with an iridescent tint. The green on my brake line parts might be part of the remaining yellow cadmium coating. I will check around further with a Nissan parts store to see what they might have. As far as a cocoon, yes that's definitely on my list before the car comes back to my garage. I could kick myself a thousand times for not doing it 15 years ago when it still smelled new inside. If I would have used a cocoon 15 years ago, I wouldn't be spending all this money with the complete tear-down, cleaning and polishing parts! So far I have $20,000 USD invested and it's now going back together. This was always my second car and I never drove it like I should. Very hard lesson learned. Are you happy with your cocoon? Who makes it? And would you recommend it. I'm thinking I will definitely need humidity control even in the cold weather. My house is 89 years old and is one of the few 1929 era houses with an unheated attached 2 car garage. And yes, it's all brick masonry and the central Illinois humidity is high almost all year long. So, I plan to get a cocoon and put it in the garage with constant humidity and temperature control. Here are some other photos taken on Friday. Thank you for sharing the photos! I believe (now) that I'm looking at an olive green tint. Yes, there is a lot of road salt in Illinois. I only drove my car twice in snow and ice, once from the dealership in January 1981 and once in February 1981 and never again in rain, snow or ice. But, It did sit in a damp farm house garage for 15 years. That's what caused the spotting on the brake lines and fuel lines. Do you have any idea of the color specifications? Thanks again! I'm steadfastly trying to restore everything on my 280zx to original stock condition as much as possible. And, the restoration crew is putting things back together now. I have attached two photos of the brake line that's under the engine compartment and I'm trying to determine the original color of the brake lines. Can any one help with identifying the original color of the brake lines? It looks like the brake lines have a green-ish color. The white spots are probably from dampness and corrosion. Engine an drive train are out. Yes, they already scratched the new engine compartment paint job. But, do you have any idea what the original color of the brake lines are? And is it paint or is it a baked-on finish? I finally gave up looking for new firewall material. I just scrubbed the rubber surface to get it super clean and set the insulation side out in the sun. After installing the sound material, the original one went back in. I just hope the faint musty smell doesn't come back.